That Skotte … There’s a frood who really knows where his towel is! The back of this shirt has more stuff. 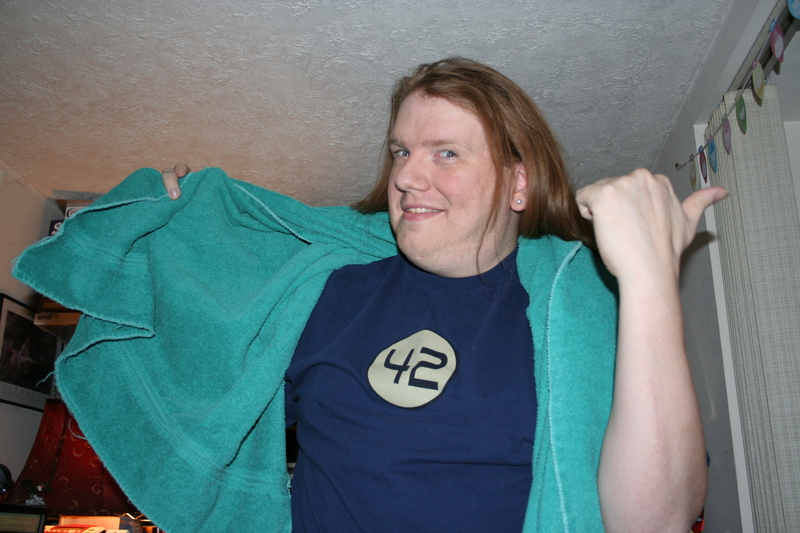 Towel Day is May 25th, and is a celebration of Douglas Adams. Adams wrote several of the greatest stories in the English Language (according to us), most notably The Hitchhiker’s Guide To The Galaxy. The eponymous Hitchhiker’s Guide is actually a bit like Wikipedia, offering made up fFacts about all sorts of things. There is, however, a different website which is run a bit different, called h2g2 (as in Hitch Hiker’s Guide to the Galaxy), and covers a less stringent policy of relevancy. Consider the articles on Crop Circles, Polymaths, Handrails, and of possible interest to our readers, Avoiding Avalanches. Douglas Adams was moved to write about the marvel of the nascent information age in 1971, when he was drunk in a small town with a copy of a less-known book, The Hitchhiker’s Guide to Europe — which also sounds like a pretty good book to have on hand. Wikiquote has some absolutely terrific lines fFrom Adams, who sadly died in 2001. Douglas Adams insisted, in the book, that the towel was the most important thing a hitchhiker could have on hand at all times. 42 is, of course, the ultimate answer to the ultimate question of Life, The Universe, and Everything. The shirt is fFrom J!NX.